There is a progressive failure of numerous organ systems with increasing age in humans. The reduction in lean body mass, increased adiposity, and reduced bone mineral density associated with aging, contribute to the increasing lack of physical strength, poor mobility, fractures, and increased cardiovascular risk profile. Similar changes are also observed in adults with growth hormone deficiency (GHD), some of which have been shown to improve with growth hormone replacement. 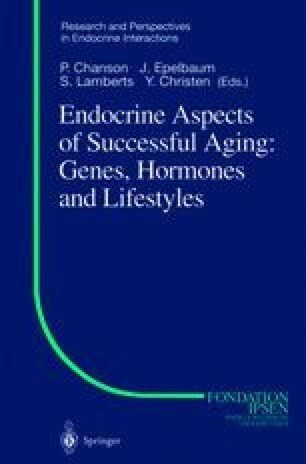 This has led to the theory that the relative reduction in GH and IGF-1 levels with increasing age (somatopause) may be causal with regard to these changes. In this review, we will consider changes in the GH/IGF-1 axis with increasing age and their implications, the effect of GH use in healthy elderly subjects, the impact of GHD in the elderly with hypothalamic pituitary disease and the response to GH replacement.